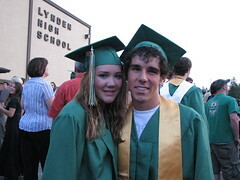 Last weekend our niece and nephew both graduated from Lynden High School. Friday night was the graduation and the two graduation parties were held consecutively on Sunday. Kelsea's party was a Hawaiian brunch in recognition of her plans to study in Hawaii this coming year. Mikal's party featured a 'roach coach' Mexican canteen and a mini car show. His plans are to attend Northwest College in Kirkland. Congratulations Kelsea and Mikal!